Entertainment Weekly was so excited by the cover of Wilde in Love that they made it #1 in a spread of their favorite romance novel covers! Lucky Eloisa — they included Pleasure for Pleasure as well! Did you know that Eloisa takes a ballroom dance class with her husband AND her two kids every week? She and her friend Damon Suede did a mamba at the Barbara Vey Weekend! Are you anywhere near New York City? Eloisa and Julia Quinn will be on a panel with Sarah MacLean & Maya Rodale in late May. Eloisa and Julia will also be attending the Historical Romance Retreat together this Fall in Spokane, Washington. (And so will Eloisa’s husband — guess who’s going to be dancing away the night in the ballroom??) 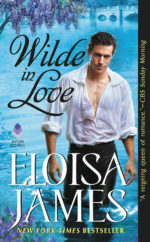 Plus, if you’re going to BEA in June, Eloisa is signing ARCs of Wilde in Love! All details are on Eloisa’s Events page. Speaking of Julia Quinn… did you know she and Eloisa put each other’s characters into their own books a few years ago? Readers loved it! Have You Read Eloisa’s Very First Book? Want a Signed Copy?